At the request of the Committee on Address of the Law Academy, a few words of preface are written in order to show the relation of the address which follows to the ceremonies attendant upon the removal of the remains of James Wilson, in the Autumn of 1906, from Edenton, North Carolina, to Philadelphia. 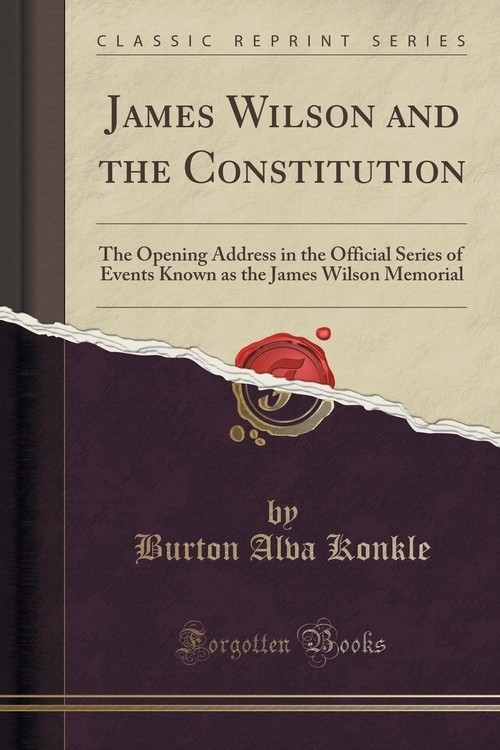 The author, Mr. Konkle, in his many years of investigation of the sources of American history, grew to appreciate Wilson, particularly his side as a statesman and a great leader of the Constitutional Convention. In his additional researches,. he discovered that the body of this eminent Philadelphian lay, unmarked and almost forgotten, in a Southern State. The thought of placing his remains beside those of his wife in Christ Church may have occurred to many in the years which have followed his death, yet it remained for Mr. Konkle to originate and carry to a successful conclusion this laudable project. The James Wilson Memorial Committee, composed of jurists, lawyers and public officials, was formed, and general attention was attracted to the movement by articles in the public press, and by an address on Wilson delivered by Mr. Konkle before the Historical Society of Pennsylvania in the spring of 1906. The interest of President Roosevelt was aroused, and a considerable portion of his speech at the dedication of the new State Capitol was devoted to a narration of the public services of Wilson. The present address before the Law Academy then followed, and was adopted by the Memorial Committee as one of the events upon the official program. The ceremonies in connection with the removal and the reinterment of the remains were of a most impressive and solemn character. The body was brought from North Carolina by the U. S. S. Dubuque, and lay in state in Independence Hall.